Providing a bespoke wedding catering service for your special day, we will tailor a menu specifically to suit your requirements. 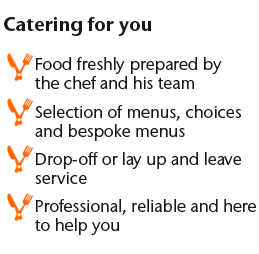 From silver service to a more relaxed barbecue style, we can cater to compliment your theme or tastes. Below are a few customer favourites! All deserts served with double cream. Prices dependent on selection chosen. Please call to discuss in more detail.